Greetings from Double Spear Ranch. We are the Blackmore Family. We make our living ranching and we have a small guest ranch operation on the side. We purposely keep it small. That keeps your ranch vacation personal, which is what we are known for. We have a high return rate because each guest feels like one of the family -- and they are. We have clean, modest accommodation. Guests experience real ranch life here, not an upscale vacation. We are located 35 miles south of Billings, in Custer Country, and are close to many of Montana's top attractions. We provide tours to these nearby attractions, for interested guests. 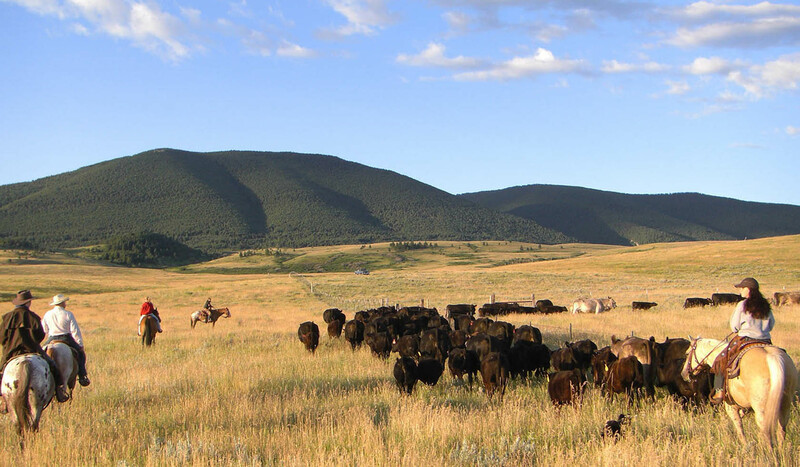 Double Spear Ranch is on the Crow Reservation, in the Pryor Mountains. We are surrounded by western history in real cowboy and Indian country. Time moves slowly here on the reservation, and many things have remained unchanged for the past 200 years. We run a lot of cows over a lot of country. Every beautiful season has its own special work, most of it horseback. In the early spring, there is calving. When the snow melts and wildflowers bloom, it will be branding time. In the summer there is tall grass, cowboy camp outs, fences to ride and cattle to move. Later, when the air is crisp and leaves turn to gold, the fall roundups begin. We are thankful to be here, and proud to share a lifestyle that has existed for generations. Come join us. Call or write for more information.